Have you ever seen an episode of a talk show where a crew completely cleans someone’s home of clutter? If the person who lives there isn’t very into it or involved (and sometimes even if they are), what usually happens? The house may look great at the end of the episode, but a few years later, when they do a follow up episode, the house is usually cluttered again. Why is that? 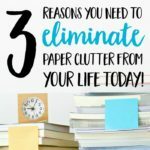 It’s not uncommon for the host and audience members to look irritated or disappointed and say things like, “Why did you let this happen again?” but it really boils down to this, decluttering isn’t something someone else can do for you. People can help to physically remove things from our homes, but if we don’t address why we’re collecting clutter in the first place, the change will only be temporary because clutter isn’t about the stuff. It’s not. It’s not about the stuff, and the longer we obsess over the stuff, the longer we put off making true progress. 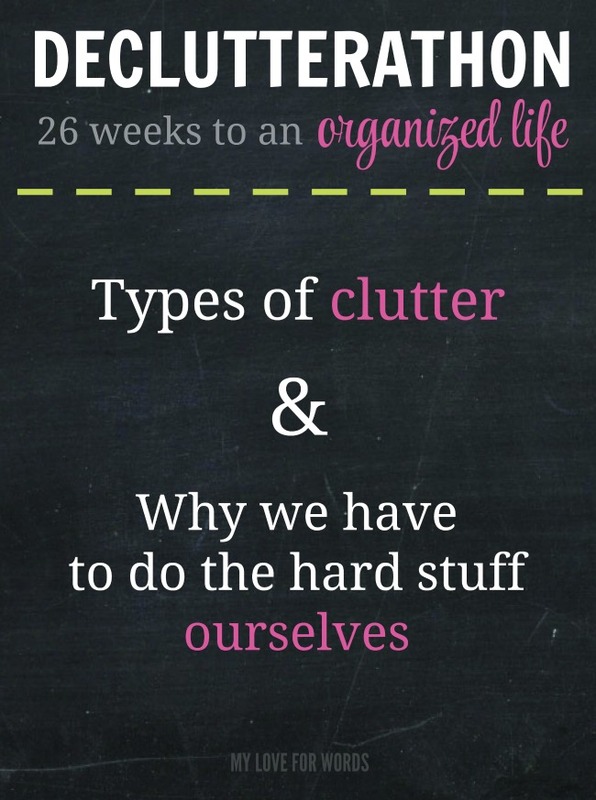 I guess the most basic place to start in all of this is to define what clutter is to each of us. There’s the basic definition of, “A disorderly heap,” but I think clutter is more than that. For me, clutter is chaos. It’s a suffocating presence that drains us of joy and peace and instead fills us with fear, hopelessness, shame, and anxiety. Mental or Emotional clutter are the thoughts and feelings that hold us back from our true potential. They may be tied to certain events, people, places, or memories, and they leave us feeling drained. This kind of clutter may prevent us from having happy and successful relationships or doom us to repeat unhealthy patterns. It can cause us to be stuck where we are (usually in the past) instead of fully enjoying the present or creating a great future. Physical clutter is probably what most people think of what they think of clutter. It’s the stuff that isn’t placed where it belongs, the piles of junkmail on a kitchen counter, dirty clothes on a bedroom floor, or a stack of books and magazines on a nightstand. This clutter can drain our energy and cause us to limit social interactions out of embarrassment and fear of what others will think of our homes. We can feel weighed down and like we’re caught in a vicious cycle of never ending tasks. It can also make us feel guilty when we’re pursuing hobbies or relaxing because we feel like we should be cleaning or organizing instead. Social clutter consists of the people and commitments who no longer add to our lives. Relationships go through ebbs and flows. Sometimes we take more than we give, sometimes we give more than we take, but when we’re constantly giving, giving, giving and receiving nothing, or worse yet mistreatment and negativity in return, it may be time to do serious work in an attempt to improve the relationshp or simply cut those people loose. It also means having a calendar so packed with commitments that you barely have time to catch your breath. Digital clutter can be a tricky devil. It can seem organized, but a computer full of pictures, e-mails, subscriptions, files, etc. can be overwhelming. I love the ease of digital photography and the freedom to take as many pictures as my memory stick can hold, but weeding through thousands of pictures trying to find the one I’m looking for can be a nightmare. Don’t even get me started on my e-mail. The unopened ones alone exceed 20,000… I wish I was kidding. The reasons for leading cluttered lives are probably just as varied as are people on the planet. Our beliefs, experiences, and pasts all play into who we are today and why we do what we do. Some of us have clutter because we’ve never been taught the skills or learned the discipline necessary to maintain an orderly home. Some of us have been so overwhelmed or hurt by something in life (maybe a divorce or the sudden death of a loved one) that it’s caused us to try to control our environments by keeping everything we can. We may feel that by letting go of a deceased loved one’s possessions we’re losing them all over again. Others struggle with depression, anxiety, or various other issues that cause them to feel paralyzed or like a clean home’s just not worth the effort. Afterall, the work never really ends so what’s the point? And sadly, some of us just don’t think we deserve any better. For some us, clutter has crept up like a slow fog that filled every nook and cranny of our homes and lives, and we just can’t see our way through or how to get out of it. 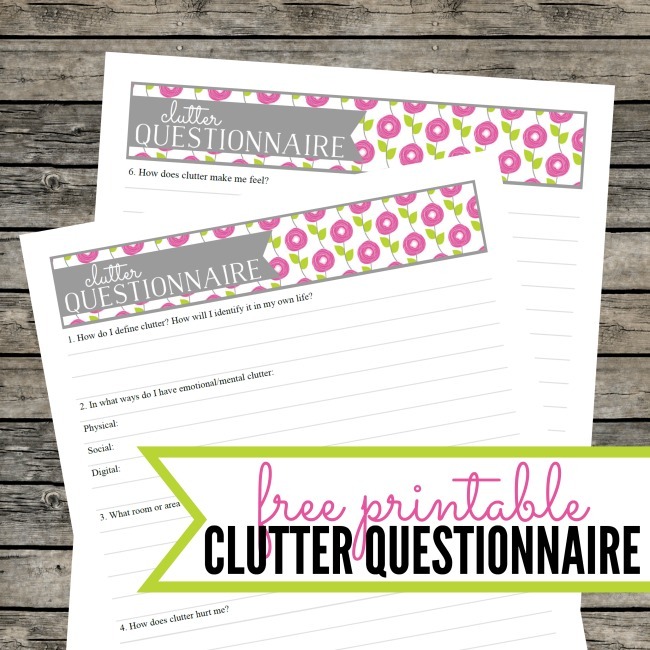 1) Figure out (or at least attempt to answer) why you have clutter. Some people may think this is a bunch of psychobabble. I probably would have a few years ago too. “Oh, please. I’m not here for therapy. I’m here for some organizational tips. 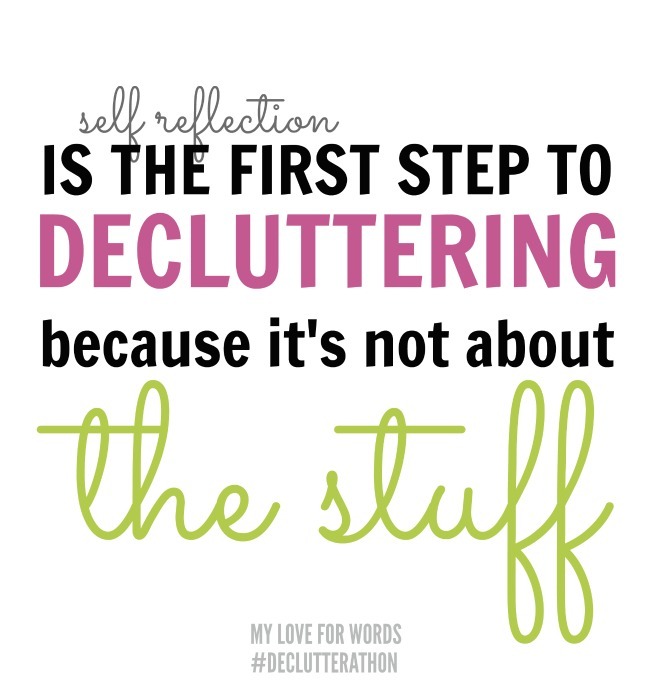 I just want a clean house!” Well, I’m not a therapist (and I don’t even play one on tv), but I do believe that self reflection is the first step to decluttering because I’ve tried the just address the stuff approach for years now, and it’s not working. I know I’m not alone. If you’ve never thought about this before and have no idea why you have clutter, that’s okay. Just having these questions in mind over the course of the next 26 weeks will help when you’re trying to decide what to keep or get rid of. How do I define clutter? How will I identify it in my own life? In what ways do I have mental or emotional, physical, social, and digital clutter in my life? What room or area of my life is most cluttered? Why? How does clutter make me feel? Do I struggle with getting rid of things? What items are the hardest to get rid of? What would an organized, uncluttered environment or life look like for me? How would an organized, uncluttered environment or life make me feel? What about my current lifestyle or habits would have to change in order to have the home I want? 2) Take pictures of your home exactly as it is right now. Capture all of the cluttered piles and closets that you wouldn’t want anyone to see. You don’t have to share these pictures if you don’t want to. You don’t even have to look at them after they’ve been taken, but we are embarking on some big changes, and we want to be able to look back at all we’ve accomplished. Gradual change can sometimes feel like no change at all, but our houses will be growing like children. You wake up everyday, and they look the same until one day you look around and realize they’re adults. Our pictures will help to remind us of where we’ve been and how far we’ve come. Taking pictures will also be great because it will give us a new set of eyes. Heather, a member of the Declutterathon facebook page, was kind enough to share one of her before pictures online. She said the pile had become, “One of the many little areas you stop seeing after a while.” Can I relate to that! I have some of the most random, misplaced piles ever sitting around my home, and I know that walking by them every day has made me kind of oblivious to their presence. For some reason, seeing these all too familiar spaces in a photograph gives me a new perspective. I’m able to see what belongs and what doesn’t much more easily than when I’m standing in the room, probably because I’m not as overwhelmed looking at a picture as I am when I’m literally surrounded by my junk. We’ll also continue our tasks from the first day of tracking how we’re using our time and focusing on completing our small daily tasks. 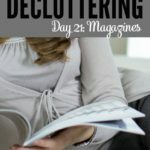 If you are energized and inspired to start decluttering, knock yourself out! We’ll be starting more of that next week, but don’t hold yourself back if you’re ready now. If you aren’t yet ready, that’s okay too. 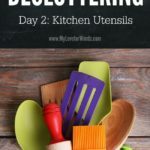 For more Declutterathon posts, click here. Please share, why do you have clutter? Are there any questions you’d add to the list above? i know I have a lot of emotional clutter. I lost my favorite aunt 6 years ago. I was the one who cleaned out her house, so I have a garage full of boxes from her house. Some of it, I have an extreme attachment to even now. Much of it I will be able to donate, though. I also lost my boyfriend 4 years ago. I have a lot of his stuff, too, that needs to move on. Most of my messy clutter comes from just having too much stuff and not really caring about it unless someone wants to come over. Then I have a heart attack and blow through the front rooms grabbing everything in sight and piling it on my bed or the bed in the guest room. I know I feel more positive when my home is neat, so I’m really doing my best to apply myself these days. It’s so great to have others that share my issues and don’t judge. Definitely no judgment here. I’ve been living the exact same way. I’m looking forward to the day that I don’t have to do a mad dash around the house like a maniac just because we’re going to have company or be embarrassed and make excuses for our house if someone stops by unexpectedly. I totally identify! I so want to live without fear, embarrassment and guilt! Sounds wonderful, doesn’t it! We can get there! I can totally relate to all said. I lost my favorite aunt, my godmother, 5 yrs ago and still have many things from her home. We also had to move my parents out of their home into apartment and have many things my mom insisted I hold onto “in case” someone needs it. Also my adult children left things behind when they moved out. So we moved within the last year into a beautiful home away from the busy city, and took it all with us! Ughhh. Way too much in my basement, closets and extra space. Things spilling out into our living area and my home always appears messy. I too run around frantic when I know someone is coming over. I feel way to disorganized and not happy with how our home looks day to day. We have many beautiful things, but too many things that don’t matter distracting from the overall beauty. It’s time. Time for me to get things back in order to have a less stressful, stop over anytime kind of home that I love the feel of. That’s my goal too, Sue. I’d love to have a home that feels like a haven as opposed to a burden of never-ending chores. It just gets so exhausting. It would be wonderful to be excited when people drop by out of the blue instead of mortified. You can do this! You are amazing! 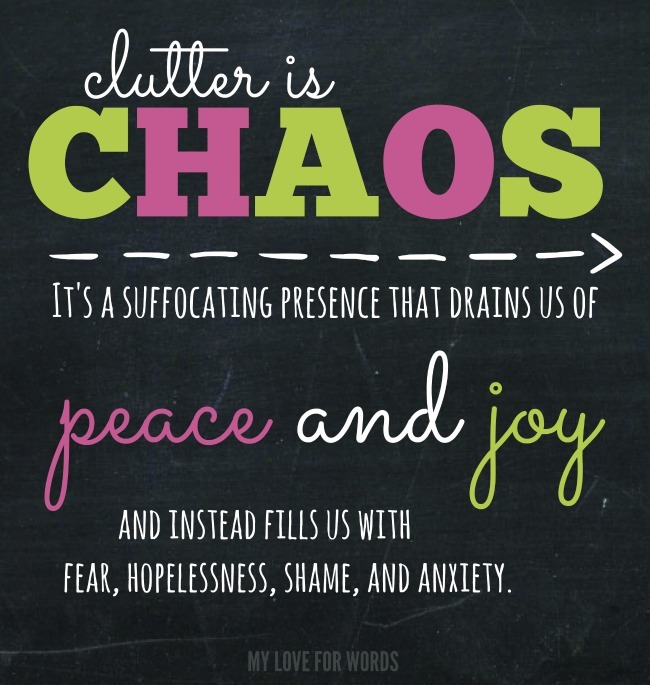 This ‘evaluation’ of why I have clutter & how it makes me feel was a great first step. I sincerely hope you’re gonna share more ideas/therapy to get us to be more ‘healthy’ in dealing with our clutter. Thanks, Prissy! There’s definitely more to come. I’m sure a lot of things will come up for me during this process, and I’ll definitely be sharing when it does. i just found this blog & desperately need it. I just inherited my parents house and stuff and am moving there. I have a house full and so do they and I HAVE to get rid of part of it all. I started a “Yard Sale” box, and after 2 weeks, all I had put in it were 2 ugly beer coozies. I’m going to read every bit of this and go forward with a different perspective! Thanks! You’re very welcome, Michelle. Good luck! I remember when my family had to sort through my grandfather’s estate. It’s a lot of work, but you can do it! Is this the FIRST one in the series??? I’d like to follow them in order…. 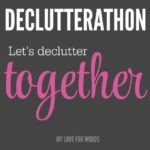 🙂 I really like your approach to the subject of decluttering: figuring out WHY we are so cluttered is so important. I’m still digging into it….. Thank you for your straightforwardness, and for your realness! Hi Tina, No this isn’t the first, but it’s pretty close. If you click “Declutterathon” in my menu bar at the top of the screen you’ll be able to find all of the links. Thanks so much for your kind words. There’s definitely no shortage of realness here lol. I love the idea of taking pictures of your house just as it is right now. It’s fun to look back later and see progress, and you’re right – it really does make you see your home in a whole new light. I love your reflection questions too. 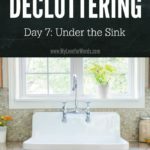 Emily, you are an excellent writer and I gained lots of helpful information from this blog post on having a declutterathon! Not only was this helpful for me personally, but it will be great information for me to share with the clients that I serve in my staging (includes delete/organize package) company: DO-STAGE! LLC. I am so ready for this! I have been in my house for over 20 years. I can so relate to all the comments & issues posted. I am working on figuring the emotional out. I have always related that when my home is in clutter & chaos, I probably am emotionally too. Then I get fed up & am a tornado & clean in both areas. Thing is I loose steam & ‘it’s good enough’, so I don’t change the mind set & the behavior comes back. I permeate every corner & nook with stuff here. I even have wood pieces/pvc pipe/metal/copper/& a bunch of other outside ‘just in case I need it someday’. We’ll someday is here & what I need is peace of mind. I was just laid off from my job of 15 years. I am ok with it & going to create a home based business that I’ve been messing with for 2 years. Exciting & scary :). The stars are lined up for me to make change in a couple life areas. Thank you for helping me in this part of my journey. Now I’m off to take ‘before’ pictures! Yay! You can do it, Angie! I’d love to see your before (and after!) pictures if you’d like to share them. i just discovered this website today! I need the help. I get paralyzed with de cluttering because I can’t get over the notion of donating vs. just throwing things away. I grew up learning to recycle and reuse instead of just throwing things away. What if someone can use my junk?! But I never seem to do anything about it. I donate clothes often but my ‘stuff’ just continues to sit around. I even have empty boxes intended for things to take to Good Will but the boxes are empty. What am I waiting for?! Is there anyone else who is paralyzed in this way too? I wish I couldn’t relate, Jan, but I totally can. Have you thought about scheduling a pickup from a company like the Salvation Army? Having a deadline like a pick up date on the calendar and knowing they’re expecting stuff from you might help. It also won’t require you do go the extra step of hauling it all somewhere since they’ll get it for you. Jan, there is also a website in my area (near Chicago) called freecycle.org. It’s a way to offer things for free to others who might be able to use them. I’ve seen the most random things posted. I got a free pair of ice skates once. So that may help if you would like your things to be redeployed. Another option is to start a local “market” website. We also have one of these near my house in Wisconsin, where people list the things they’d like to sell and only those who have been admitted to the site can respond. My sister is the administrator of this Facebook page, and it takes some work, but tons of things get bought and sold all the time, so if you have trouble throwing things away, that might be another option. I have a husband who won’t let me throw away used pens (despite our stash of hundreds) so I understand the mindset. These might offer you a couple of solutions short of tossing things you think might be of use to someone else. I kept things from my grandmother. Obviously her heirlooms and some furniture were no problem but I kept junk too, like the funnies from the Sunday paper she used to save for me. I would read them and throw them away before she died, but after I couldn’t bear it. So all the stuff I knew I needed to get rid of, I put in boxes in the garage. I knew it was there and then a few years later I was finally able to throw it away. I just needed time. I’m so glad to hear you gave yourself the time you needed. Sometimes that’s all we really need; time to process what has happened and let go. Thanks for sharing, Alex. Wow! I thought the assignment of taking pictures of your clutter was unnecessary…. I mean, I know what it looks like. But, I did it anyway, and it blew me away! Now I have concrete examples of what I need to work on. Thanks so much. I also enjoyed filling out the questionnaire. I found it very helpful. Yeah!! I don’t know what it is about pictures that can make us see a space (especially one we’re in all the time) differently, but it really can. I’m so glad to hear it helped you! Thanks for letting me know, and I hope you’ll keep us updated on your progress. I’m a habitual clutterbug. I will go into cleaning mode and perform a “tornadic” cleaning in one area of the house and make it look perfect while the rest of the house looks like a bomb went off. I exhaust myself, but I have one area that is good. Then the clutter begins to “ooze” back into the perfect area and I’m right back to where I started. I am really glad to have found this website and want to work in a methodical fashion and create a clutter transformation – a complete change throughout my life! Hi, just a word to the wise, I use freecycle all the time , I am also trying to declutter.Freecycle is in almost every state/city.You put up an offre of something you want to be rid of(I got rid of my old vhs recorder/player about a week ago. )For big boxes of stuff that freecycle won’t take, I go to Savers, Salvation army and Good will. I may have mispoken…if you have a box full of kids toy, clothing (all in the same size) outgrown kids clothes , baby items etc They will post them for you.Manypeople put up wanted items I got rid of an old boombox I didn’t need. and someone got something they cdn’t find to buy. It is all free,and a win win app.Not to clutter your mind…. They also have offers, like, moving boxes, you e-mail them thru freecycle and agree on a place to meet to make the hand off.I hope I made this clear for you. Just type in freecycle with your cities name and take a look.Good luck.!!!! That’s a great tip. Thanks, Marcia! I’ve never used them before, but I’ll definitely check them out. I’ve been surrounded by clutter my whole life! My parents always(and still do) have clutter. I lived with them till my mid 20’s and not only was there clutter and disfunction…there was a lot of abuse mostly mentally and physically but amongst all the clutter my mom kept everything clean and sanitary! My dad to this day has been renovating and ripping apart the house but never could complete it…so now being in my second home with my husband and only child…why do I have so much clutter? I’m trying to answer your questions but can’t find the reasons. I’ve tried taking pictures, but the clutter still stares me in the face! Some areas I will reorganize and some I won’t touch I have some sort of guilt removing things but can’t figure out why??? I think (hope) the answers will come as you dig into those feelings. How do you feel when you’re about to get rid of something? Do your feelings change depending on what you’re getting rid of (trash vs. sentimental items)? Perhaps the answer is that this is how you grew up so you haven’t yet established good habits. (If that’s the case, I can completely relate.) Some people are also comforted by having clutter because they feel like it’s proof that they’ll always have enough, even if it ends up being much more than they really need. Taking pictures helps me see my clutter in a way that just looking around my house doesn’t. I think we can almost become immune/too accustomed to living in clutter that we don’t see it all anymore, but seeing pictures of our rooms can help us identify clutter that’s still lingering and could be gotten rid of. I hope that helps! You’re more than welcome to leave more comments and join the Declutterathon group on facebook if you aren’t there already. The group provides great feedback and help for those struggling with clutter. Thank you so much for this article. I think you have gotten to the bottom of the problem. I’m 55 y/o and I find myself in a complicated spot. I live alone (with several pets) in a 4,300 sq. ft. house that my spouse and had been remodeling at the time he abandoned the family, 3+ years ago. The two children are grown and gone as well, and I am left with an unfinished home, having to sort out the remnants of an abusive 25 yr. marriage, my children’s childhoods, many cherished memories and the material belongings acumulated in all these years. I have RA and Fibro too, and no family in this continent for support. I thought the divorce would be an easy thing and I’d be able to relocate far from here and start a new life soon, but the second-rate lawyer I was able to afford has stalled the case to no end. I had avoided making new friends or getting into another relationship because I would have to leave them behind and I didn’t want to play with people’s feelings, so now I’m still completely alone just as when I started. I live in an out of the way area and it takes a long drive to get to meetings or any kind of amenities, another reason to leave this place behind asap. In the meantime, most of the rooms in this house are closed and I’m using just the few spaces I need. There is stuff (not trash, broken or useless things covering floors as we see on tv shows) in those rooms that have been left on top of furniture and inside closets and need to be sorted out before I move, but I find it a very difficult physical and emotional task. I just cannot part with things like the beautiful baby and toddler clothes my mother bought or knitted herself or the beloved stuffed toys, among other things. I cannot afford to hire help, either. Since I’m not able to work, most of the time left after the daily chores is employed quietly doing things I find extremely fulfilling, give me much solace and had to put on hold during the marriage and child-raising years (needlecrafts, reading, stamp collection, 1:12 miniatures and other hobbies) but the ‘stuff’ that is behind closed doors and everywhere in this house keeps calling me to do something, already. I’m so sorry to hear that, Sirena. I can relate to feeling like stuff is calling me though. I can’t quite relax and enjoy my home because I always feel like I have so many things I *should* be doing. It can be emotionally exhausting. I hope you’re able to get some resolution soon. I think I was just finally able to really say to myself why my house is so cluttered…my biggest clutter items are kids art/ school work and clothes they have grown out of. I have five kids so there is a LOT of this stuff! I feel like if I get rid of these things that their childhood, their littleness will be gone forever. I feel by saving it that when they grow up, they will see that I saved it and they will think I was a good mom and I cared as much about their things as they did at the time. In my mind I know this is silly but getting rid of things is very emotional for me…and then my oldest son almost died and it validated me saving all that stuff. What if I had gotten rid of it and had nothing to show for his life? Exactly it starts with you and your choice before the stuff leaves the house!